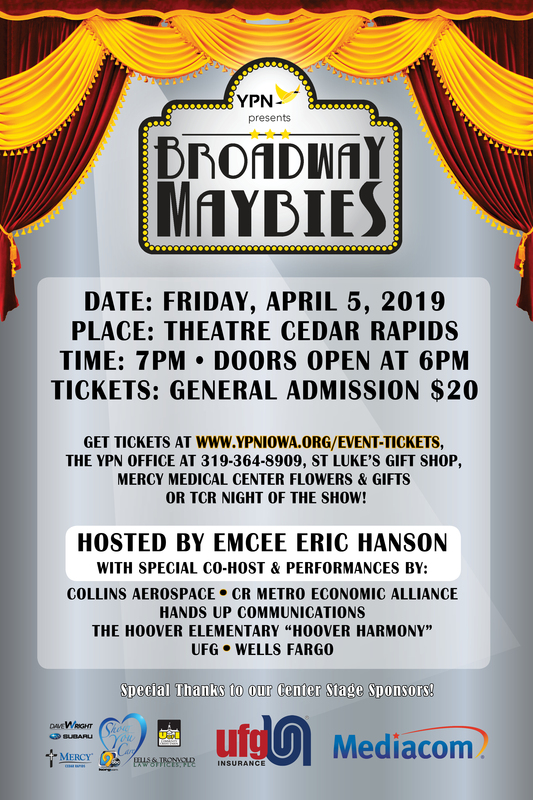 YPN’s annual fundraising event, “Broadway Maybies”, is a fun-filled evening of entertainment including skits, musical performances and more all by local talent. For 29 years, staff, volunteers, corporate partners and other supporters have come together to highlight the impact that is being made on a daily basis right here in Cedar Rapids. This unique fundraiser has not only proven to be an enjoyable evening of fun, but it enables YPN to continue to build healthy families. Plan to join us on Friday, April 5th, 2019! TICKETS NOW ON SALE! Get your tickets to attend our show ONLINE or by calling our office at 319-364-8909 or stopping in at 420 6th St SE, Ste 260. You can also get them at St. Luke’s Gift Shop or Mercy Medical Center Flowers & Gifts, or at TCR the night of the show. But, don’t wait until then!! RAFFLE tickets are also on sale NOW! Only $5 each or a bunch of 5 for $20! This year we’ve got 4 great prize packages for you to choose from. Place your tickets across them all or place them all in one for a greater chance to win. Learn more about how to purchase your raffle tickets and details HERE. Many parents aren’t prepared for the challenges of raising a family. Your support powers the programs that offer them hope.